Here's a 3D interactive plot I like from the ebook "R Fundamentals & Graphics". I've just started learning BLENDER and want to see if I can transfer these 3D images to BLENDER and save it as a .COLLADA file. Has anyone ever done that? Apple has a software called iBook Author which can accommodate interactive 3D images in COLLADA format in ebooks. Their promo video is really cool! I guess this belongs here. Its a shiny App. And I love it. probably more beautiful than useful. Just for fun. I saw this image (from: http://www.pewinternet.org/2015/01/.../pi_2015-01-29_science-and-society-00-01/)and wanted to replicate it as an exercise. I provided the data beolw. See if you can do better. I used ggplot2 + Inkskape for some touchups. I left the code. "Space station has been\na good investment for U.S."
ext[c(5, 13)] <- "point gap"
TE gave a 'Thanks' to a ggplot graph. The thanks went to trinker. Still technically all the work IS being done in base - trinker is just evoking ggplot to "talk" to base for him. Good work. However, I am not a fan of the figure - it is kind of confusing or not immediately readable. It needs the full scale 0-100 listed some where relative to the values. Perhaps you can also see what happens if you color code the magnitude of the gaps based on say yellow to red continuum, instead of all being blue. It needs the full scale 0-100 listed some where relative to the values. The scale is implicit with the inclusion of percentages. Whenever we can get rid of an axis scale and put it with the geom our eyes are doing less back and forth. I like that the scale info is on the geom as it gives precise values like a table would but it's in grey so it's not primary in where our eyes go. We have to focus attention to see these. The percentages are only done once in each multiple to avoid extra ink. I liked that. 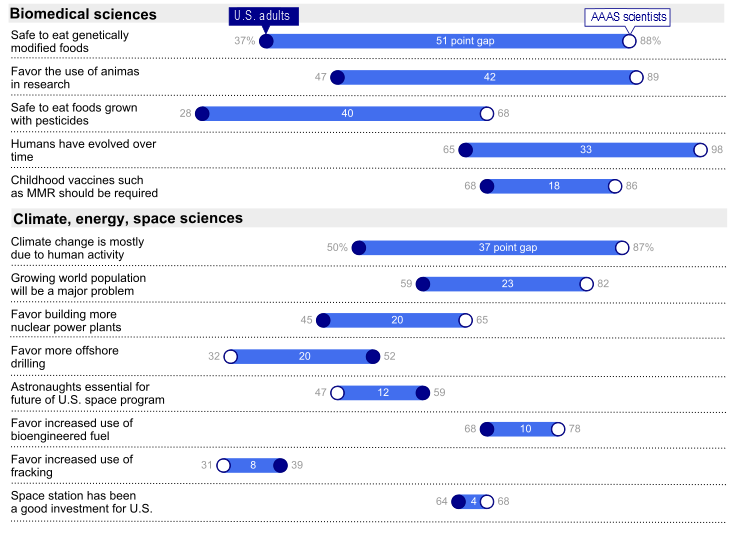 Related, I liked the direct labels of Scientist and Us adults. This again reduces back and forth looking up of labels. I can see your point on the gradient but this information is already coded in the length between the points. Adding a gradient would probably aid in comparison but the best preattentive attribute we have for comparing continuous values is length. Color gradient is typically a poorer choice, particularly with smaller geoms like points. I think because the segments have different zero values comparison is not as easy and a gradient may improve this. It also runs the risk of distracting from other trends shown that are already using color (i.e., the way the scientists and people flop on 3 items; this is shown with color on the point and a gradient may distract from this). I can tell you like your graph. I had not notice the flip-flopping of the group orders and the respective differences. That is confusing as well, I may not have even noticed that it happened in the same categories. Perhaps you should use a different color when the groups flip-flop. You did a good job copying the figure, now you need to improve it. The original could not have been perfect or without any room for improvement - now is the time to maximize readability. Yeah, I have no one at my work to bounce ideas off of, I can appreciate your situation! Agreed. This sounds like a challenge. Anyone that wants to submit an idea I included the data and as a csv for non R users as well. I was thinking a bumpchart may show the trends better. 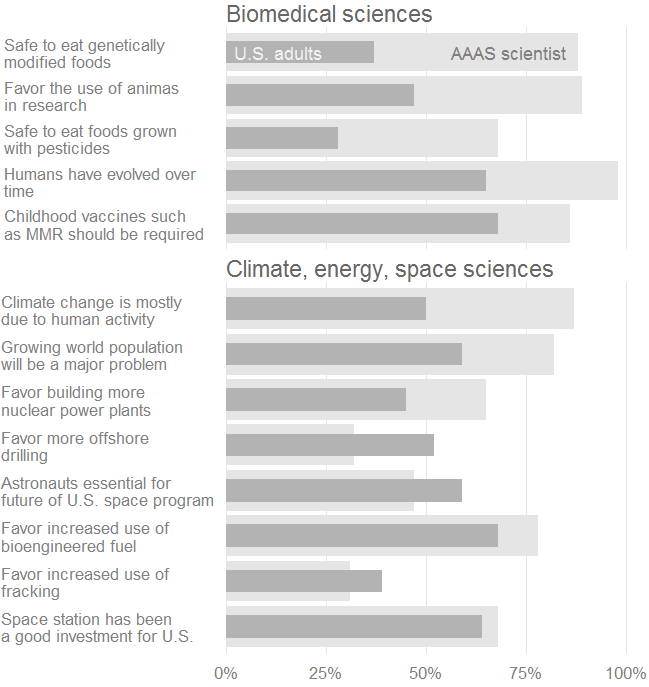 "Favor the use of animas\nin research", "Safe to eat genetically\nmodified foods"
I decided a bar plot may be best here. I toned down colors all together and focused on the differences between scientists and the US people. TO me that's the narrative. As such I ordered the Items by larges difference. I didn't go with direct percent labels this time to draw attention to the geoms. That's a Wickham specific term from ggplot2, his extension of Wilkinson's Grammar of Graphics. It's the geometric shape that represents the data. Attributes of that geometric shape (e.g., color, fill, alpha, shape) are the visible aspects that can encode information or be used to highlight. Hi, I'm sorry to bother you, but how can I have access to the Dataset? It says that I've got no permission..
whatch you be talkin about? In the process of trying to understand a particle swarm optimization algorithm I ended up coding one. It makes for a neat visualization, so I thought I would share it here. Should work if you copy and paste!